Disclosure: As an SEC Registered Investment Advisor, I often recommend to clients that they maintain a strategic relationship with a credit union. Doing so can provide high quality loan services when necessary, in addition to a dramatic reduction on all fees, including VISA interest, etc. I am a true believer in Credit Unions, although they were never designed for large deposit balances. My previous experience includes being a Certified Public Accountant and Chief Financial Officer at the State’s 3rd largest credit union. The purpose of this comment is to use the proposed merger between First Technology Credit Union, based in Portland. Oregon, and Addison Avenue Credit Union, based in Palo Alto, California, to highlight that while banks are taking a beating over executive compensation, almost no attention has been given to credit unions. Doing so reveals a full spectrum of situations, some needing additional disclosure. Also included are simple reform proposals. Also see updated blog post on October 20, 2010 following approval by Oregon State regulators. 1) Make all compensation to credit union executives in excess of $500,000, indexed to inflation going forward, taxable to the credit unions at ordinary income rates and all compensation and benefits in excess of $1 million to bank executives non-deductible for tax purposes. This will provide a strong incentive for both credit unions and banks to self regulate a fix on excessive compensation. 2) Require both federally and state chartered credit unions to include complete disclosure of executive compensation on quarterly call reports. Currently, only State Chartered credit unions are required to disclose this information via annual 990 filings with the IRS. This is especially important in mergers such as that proposed by First Technology since their merger partner is Federally chartered. 3) Limit credit union board member terms to a total of 8 years, after which they would be unable to participate as board members for 4 years. In First Technology case some board members have served more than 15 years. This is a merger that makes no sense and will result in meaningless job loss, regardless of what is publicly stated. Also not disclosed are the specific financial terms offered to executives, i.e. is Sargent getting a payout for the merger, etc? While this may make sense in private industry, it makes no sense for tax exempt organizations like credit unions. First Technology CEO Sargent, who is attempting to orchestrate this merger, earned $820,000 in reportable compensation in 2008, per IRS filing 990, in addition to $1,532, 000 in other compensation from related entities for a total of $2,352,000. 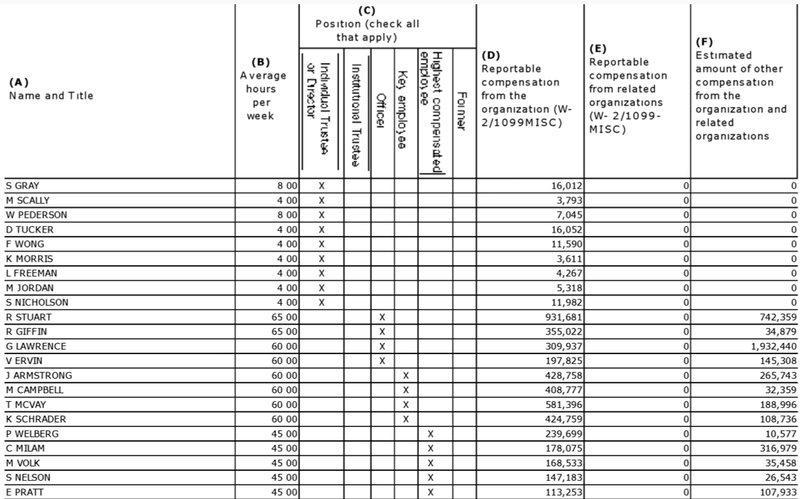 No where is this total compensation package of $2.3 million are the specifics or total amount directly disclosed to members. 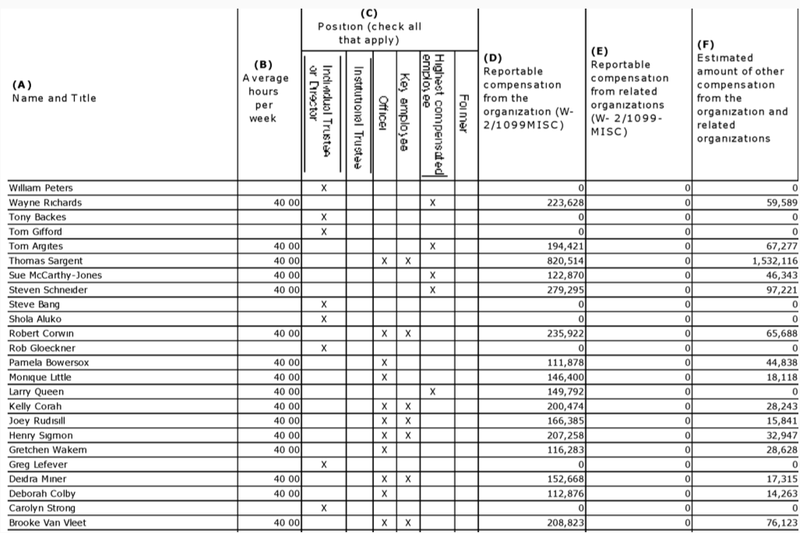 The second highest overall compensation if roughly $400,000. In addition, it has not been disclosed exactly what the terms of “other related compensation from related entities” includes, primarily deferred comp. 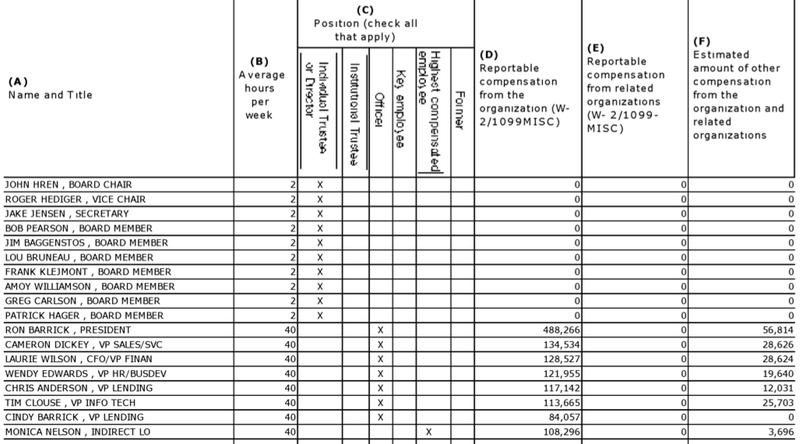 See summary from page 8 or 2008 IRS 990 filing below. The CEO of Addison Avenue, Benson Porter, was previously Chief Administrative Officer for Washington Mutual Bank for 11 years thru February 2007. The bank later collapsed in September 2008. There are no public disclosures regarding his compensation agreement nor whether he or Sargent get a merger bonus or other related financial benefit. First Technology has roughly 400 employees and rather than merging its board should focus on finding a new CEO, especially given the large number of qualified candidates available. A secondary benefit would be to preserve a good number of quality jobs that would be needlessly lost to consolidation. Compensation Summaries are listed for 3 of Oregon’s largest credit unions, after which is a summary of how to evaluate your credit union. Overall, Advantis has a balanced reasonable structure while Onpoint and First Technology raise obvious questions. 1) Determine if state or federally chartered. If state chartered simple go to the following website and print off the annual form 990 filed with the IRS: http://www.foundationcenter.org Once there, highlight the “find funders” tab and select “990 finder.” Input the name of your credit union and then print off the report, roughly 20-30 pages. 2) Evaluate the executive pay structure as an initial test in that excessive compensation is an early warning sign. Look for “other compensation” and if excessive write a letter to the Supervisory (Audit) Committee and copy the Chairman of the Board to determined its nature. This letter should not go directly to management. In First Technologies case other compensation in 2008 is mostly deferred comp, which was listed as zero in the 2007 filing. 3) For federally chartered credit unions visit http://www.cuna.org This is the Credit Union National Association responsible for regulating federally chartered credit unions. 4) Review the allowance for loan losses and divide this total into total loans outstanding. This provides a good view of how well the credit union is preparing for future loan losses. In First Tech’s case, this allowance is $11M on a portfolio of $1.2 billion, or approximately .9 percent. To me this seems especially low, meaning net income and related capital ratios are likely overstated. A more normal ratio, especially given the current environment, would be 1.5 percent. The reason this is important is that it shows how well the credit union is prepared, with reserves, for future loan losses. Furthur Comments on First Technology Merger: As an Independent SEC Registered Investment Advisor, my purpose for this analysis is to support various clients, who are members of First Technology, and oppose this merger. If you have further thoughts or observations the best person to contact is Jeff Manning of the Oregonian, who has already been briefed on this blog post. Manning is a superb reporter who specializes in financial institutions. His email is jmanning@news.oregonian.com Telephone: 503-294-7606 The truth is that good journalists love getting feedback and so don’t hesitate to contact him.